A poor loss tonight in the Monthly Standard. I was effectively lost after move 11, even though I had a number of excellent alternatives ( ie Nc5, Ne5 or Nb6), but instead played the dubious Qc7. 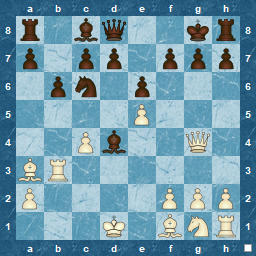 I still had possibilities with the same sort of choices ( ie Ne5 or Nc5 again ) but just played a bad Re8. Not seeing the killer White response for move 15 that won the exchange, finished me off. I have to admit, I am not sure why I played 8...a5. I think the usual response is b6 to ensure some sort of queen-side attack, but I will check that out and see what 'should have happened'. I re-visit of my standard statistics shows a poor record ( Played 32, Won 8, Lost 24 ), but when you put my rating on to this ( 1477 ) and the average of my opponents ( 1646 ), things aren't so bad. I have a good record against lower-rated opponents, its just that in the Open Tournaments on ICC both first and second rounds can be against high-rated opposition ( and sometimes even the third round ! ), so chances of a win aren't too high. I'm not sure why this should be, maybe that fewer lower-rated players don't want to play in these standard tournaments, so all are lumped together in the Open, rather than the two sections that apply at other times. Regardless, I will persevere !